Do you know how much exercise your dog does in a day? You might be surprised! We all know that us dogs need exercise to stay healthy, according to Mum fellow doodle/poodle owners will know that unless we are properly exercised we are a nightmare to live with as well as leaving us open to a number of weight related diseases, just like our humans. Some breeds are more susceptible to being obese than others, top of that list are Labrador Retrievers, Pugs and Dachshunds, obesity in dogs can affect every aspect of their lives and ultimately it has been show to shorten their lifespan. Diseases such as diabetes, heart disease and increased blood pressure, respiratory diseases, digestive disorders, cancer and decreased liver function are all more common in dogs categorised as obese than in dogs of a healthy weight as well as making them more susceptible to bone and joint problems, problems with their skin and coat, increased risk from anaesthesia if they have to have surgery and decreased immune function. Add on top of all those risks a shorter lifespan than dogs of a healthy weight and you wonder why anyone allows their dogs to become overweight in the first place. This is primarily due to naughty humans over feeding and under exercising their dog(s), this is where PitPat comes in. PitPat is essentially the Fitbit of the canine world. 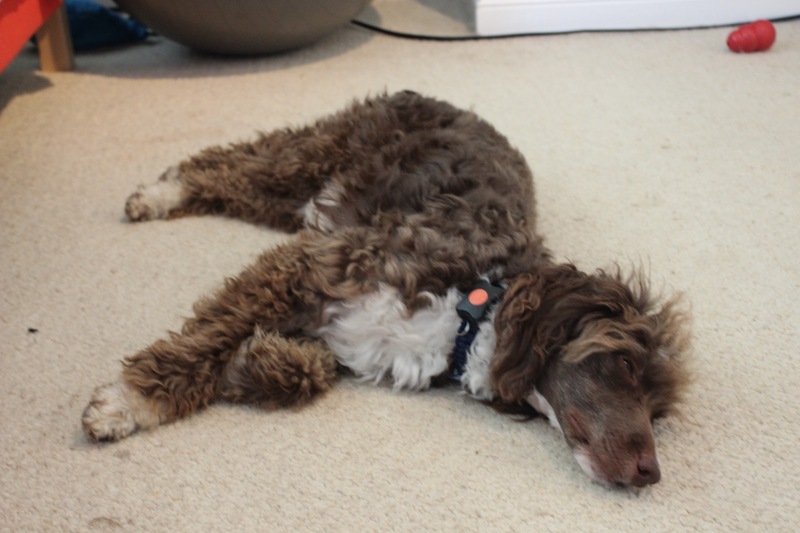 Using much of the same technology as the human activity monitors, the PitPat records your dog’s daily activity. The advanced technology in the monitor calculate exactly how many minutes of activity you have done in a day (to the nearest 5 minutes). Not only does it record how much activity you have done but it also splits the activity into four categories by using some very clever algorithms; Playing, Walking, Running and Resting. The overall calculations of minutes of activity per day seems to be very accurate but the distinctions between the different types of activity is hard, especially between running and playing. For example, if you are playing fetch is that playing or running? Overall this seems like a minor fault, after all, the overall activity time is more important that knowing exactly what I was doing! In the future the PitPat will also be able to tell you exactly the distance (in miles/kilometres of steps) you have travelled in a day too, this was a feature that Mum felt was missing from the current model. The other feature that PitPat is currently lacking is a built in GPS tracker which some other activity monitors on the market offer, again this is something that PitPat are developing for the future, plus we have our GPS tags from Pet Touch ID so we’ve got that covered! The PitPat app is free to download from iTunes or from the Android store and it can support up to three PitPat devices for multiple dog households. The app is extremely easy to use, the first time you use it your human is asked for your details; name, breed, weight etc. and the app uses this information to give you a daily activity goal. The goals have been set in collaboration with some vets, the Veterinary School at the University of Bristol and the Kennel Club as well as constantly being reviewed using data from real users. Your information then becomes the first page on the app, you can edit this information any time you like. The second page on the app tell you how close you are to achieving your daily activity goal as well as showing you a graph of the day’s activity so far. The third and final page on the app shows an overview of daily activeness. It shows almost two weeks of data on one page allowing your humans to see any trends in your activity over time. You can then click on any chosen day to see the break down of activities, as shown above. The app also calculates the average minutes of activity per day using all the data available. The second and third pages also have the PitPat bone icon in the top right corner. This is what your human needs to press to sync the data from your unit. They just click the icon, push the red button on your unit (making sure the Bluetooth on their phone is on!) and all the data is synced. Easy. You do not have to sync your PitPat everyday, you will still get all the data for every day even if you have not synced for a few days. with other dogs, chasing sticks into water, but in the last three weeks of use, and a number of collar changes, my PitPat hasn’t come the slightest bit loose even once. Must be magic. As I am a fan running through muddy puddle, or just playing outside in the rain, it is a good job that my PitPat is waterproof for up to 30 minutes at a depth of 1 metre. Good news for those of us that are partial to a quick dip, or for you crazy dogs that actually like to swim! It even survived the ball pit pool! “How expensive is an amazing, high-tech gadget like that?” I hear you say. Well this is where PitPat really puts itself into a different league to it’s competitors. The unit that attaches to your dog’s collar is just £39.99. The app is free and there are no subscription charges. When you consider the advanced technology that is inside the little tiny units, and the fact that the next dog activity monitor on the market is £20 more expensive (and the sky is the limit for these things! ), you begin to realise how much of a steal the PitPat is. The battery is the only other associated cost with the PitPat but this is minimal as it uses a CR1632 coin cell battery, similar to that in a human watch, which is widely available and costs about £1. When you consider that the average life of this battery in a PitPat is over a year, this really is a negligible cost. Overall we’ve been really impressed with our PitPat device and I would definitely recommend it to all my doggy friends, whether overweight or not. Next time your humans decided to treat you, tell them you don’t want a fancy new collar or a flash expensive coat, all you want it a PitPat, trust me, you won’t regret it! If you are in the UK, you could also win one in our UK vs. USA Epic Fluff Fails competition on Instagram. Click here for more details! In case you’ve been a little lost in this long review, and well done if you read it all the way through, here a quick summary of the pros and cons! For more information and to keep up to date with the latest PitPat news check out the PitPat website and social media channels!